(Newser) – China wasted little time in summoning the US ambassador to Beijing on Sunday to protest the detention of a Huawei executive in Canada—immediately on the heels of warning Canadian envoy John McCallum that there would be "grave consequences" if Meng Wanzhou is not released. Vice Foreign Minister Le Yucheng "lodged solemn representations and strong protests" with Ambassador Terry Branstad, calling the arrest "extremely egregious" and demanding that the US "immediately correct its wrong actions," reports the AP via the official Xinhua News Agency. A Communist Party editorial took it further, notes NBC News, saying "only if the Canadian side corrects its mistake and immediately stops infringing upon the lawful, legitimate rights of a Chinese citizen ... can it avoid paying a heavy price for this." Roland Paris, former foreign policy adviser to Canadian PM Justin Trudeau, shrugged off the pressure. "Perhaps because the Chinese state controls its judicial system, Beijing sometimes has difficulty understanding or believing that courts can be independent in a rule-of-law country. There's no point in pressuring the Canadian government. Judges will decide," Paris tweeted. Canadian prosecutor John Gibb-Carsley said in court Friday that a warrant had been issued for Meng's arrest in New York on Aug. 22. He said Meng was aware and had been avoiding the US for months. 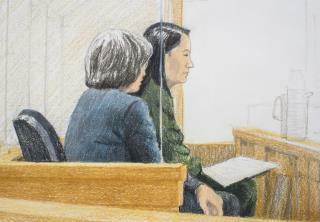 Gibb-Carsley said the Huawei executive had vast resources and a strong incentive to bolt: She's facing fraud charges in the US that could put her in prison for 30 years. The hearing will resume Monday. Huawei, in a statement, said "we have every confidence that the Canadian and U.S. legal systems will reach the right conclusion." Kind of odd. She knew of the arrest warrant and still came? Confucious say: WTF? What go around... You no want listen, so we no listen. For translation extend middle finger and find hole. To China: Waaaaaaaah. I'm glad we are demanding her extradition.